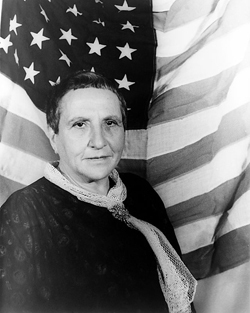 Gertrude Stein (February 3, 1874 – July 27, 1946) was an American writer of novels, poetry and plays. Born in West Allegheny (Pittsburgh), Pennsylvania and raised in Oakland, California, Stein moved to Paris in 1903, making France her home for the remainder of her life. A literary innovator and pioneer of Modernist literature, Stein’s work broke with the narrative, linear, and temporal conventions of the 19th-century. She was also known as a collector of Modernist art.